With all the rain we have been having in London, I don't blame folks for hitting the treadmill indoors. One morning though, I made it to the gym at 7am on a clear day. As I looked around the gym, I saw several people walking on a treadmill while overlooking the beautiful docklands. All I could think was how nature and the outdoors are FREE. We should be taking advantage of good weather (especially in London!) when we can and get outside. This weekend, I would like you to choose an outdoor activity and give it a try. Ride a bike, rent a canoe, go bird watching (guest post coming soon! 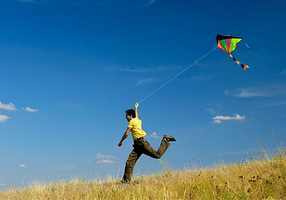 ), take the dog and kids for a walk, hit the trails for a run, fly a kite. I even encourage you to leave your I-pod at home and enjoy the simplicity of movement. Invite a friend and catch up while you sweat. Listen to the landscape around you. I am eager to hear of your outdoor adventure. Please let me know how it goes by commenting on this post.